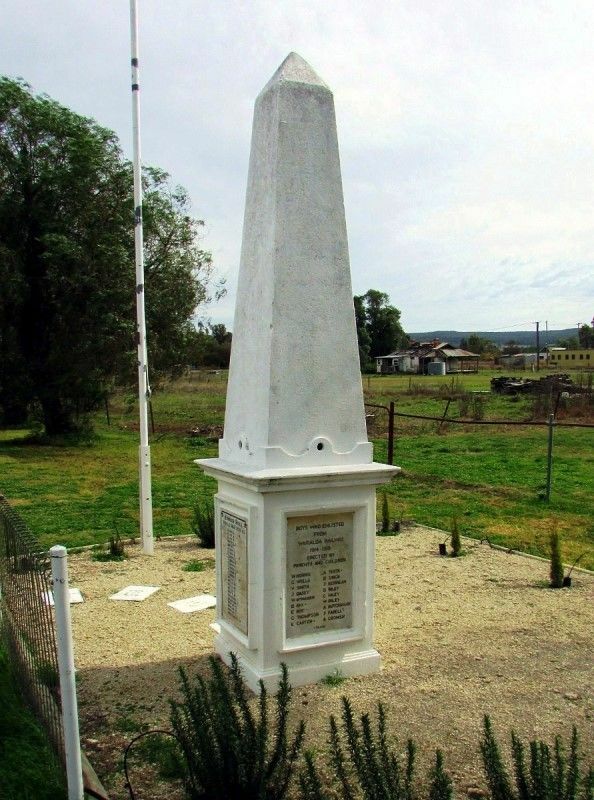 The War Memorial was originally erected in memory of those from Warialda Railway who enlisted in World War One. 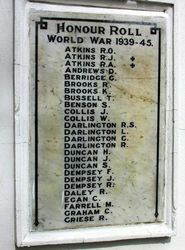 Marble tablets commemorating those who served in World War Two were added to the memorial on the 27th July 1946. 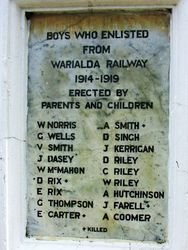 The memorial was originally located at the Warialda Railway Public School where it remained until the school closed and the land sold. It was then moved to its present location in a park near the old tennis courts. 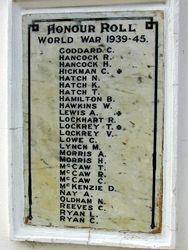 Stone obelisk with honour roll. The unveiling of the Honor Roll and Obelisk erected by the Parents & Citizen's at the Public School attracted a huge crowd on Saturday week. The days proceedings consisted of a Basket Picnic, races for the children, and the unveiling ceremony. A good supply of toys and fancy goods was provided by the residents. All the school children and little tots receive a prize, and in this way about two hundred little hearts were gladdened. As a liberal supply of refreshment's was on hand it was indeed a big day with the children. Mr. T. Way had charge of the children's events. At 3 pm. the unveiling took place. Mr. J. Berridge, chairman of the Parents & Citizens' Association, welcomed the visitors, and in a very able speech eulogised the boys who had gone so far to defend their country. Mr. S. Robinson also added words of praise for our gallant lads. Mr. McGregor of Warialda spoke of the debt we owed to the Motherland in the huge struggle. Lieut-Colonel Bruxner, M.L.A, in an interesting address recounted many stories showing the gratitude of the people of Palestine on coming under British Rule. This address was most suitable for the occasion. The Chairman then called on Mrs. H. A. Smith to perform the ceremony of unveiling the obelisk. 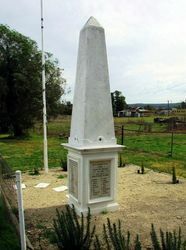 The obelisk stands 12 feet, high, and is similar in design to the Warialda memorial. The company then repaired to the school-room to witness the unveiling of the School Honor Roll. Mr. D. H. Drummond, M.L.A. , in a very suitable address, spoke of the value of these School Honor Rolls, and of the sacrifice of the boys and their parents. Mr. Jackson spoke on behalf of his predecessors and of the importance of practical patriotism. Mrs. M. A. Nay then performed the ceremony of unveiling the Honor Roll. It is constructed of Wunderlich and contains the names of old school boys. 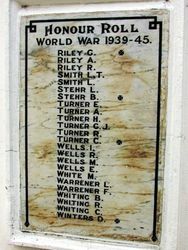 An impressive, dignified and necessarily solemn function was carried out on the evening of the 27th July at the Public School, Warialda Railway, namely, the unveiling of tablets bearing the names of those who took part in the Second World War, and showing the names of men who made the supreme sacrifice. Mr. W. R. Daley, President of the Patriotic Association, carried out the ceremony. He made a very appropriate speech, and then withdrew the flag revealing the marble tablets very well done. They are made part of the monument to the first World War. The National Anthem was sung and a wreath placed by the P. & C, Association. WORLD WAR 1939 - 45.